We're having a blog hop to celebrate the 2nd Anniversary of A Blog Named Hero! How time flies when you're getting inky! I'm the last stop on the hop and you should be arriving from Kelly's fabulous blog here. If you are just joining us you can start the beginning of the hop here. You will want to hop and comment along the way as we have some wonderful prizes up for grabs from Hero Arts and Simon Says Stamp. The more you comment the better your chances of winning a prize! I used lots of Distress Inks on my card today, along with embossing and die cutting. I sprayed Perfect Pearls over everything to get a subtle sparkle and to let the ink colours blend together. Love the texture on the balloons from the splotches of Perfect Pearls. I glued 6 balloon die cuts on top of one another to get a thick chipboard effect, then die cut the balloon shape from the embossed background and nestled the balloons into the recess made by the die. Thanks so much for joining the hop and celebrating along with us! And thanks for all the amazing inspiration from the ABNH designers new and old and all of our guest designers! Nice colours for this card!! I Love it! Love the card, it's got purple in it. Very pretty in these colors!! Beautiful card! I love that you've used purple! Sue this is gorgeous, I have a hard time with purple...but you have made it shine..literally. Lovely !!! Bright and nice !! LOVE these colors, Sue!! Such a pretty card. Lovely cards. I love the layering on the balloons. They really draw the eyes. Thank you for sharing & for being a part of the birthday blog hop. Beautiful card. I love the colors and the balloons just pop. Thanks for sharing. Distress inks are my most used supply on my craft room....your card is fabulous! That vibrant blue is so gorgeous. Great card! Like the colors, background, balloons & sentiment letters. Oh I do love your card. Great techinques. TFS. Love your card and the gorgeous colors. this has been a fun blog hop with lots of inspiration. Beautiful colors and super fun card! I am ready to try this technique...perfect pearls are great and shiny!!! Lovely blend of colors, such a pretty background!! Lovely card. I love the background and the colors you chose. Such a fabulous card, Sue! I love how you inked/blended your background, then matched your balloons...so cool! Thank you so much for being part of the hop! I had a lot of fun, and I love that your blog was saved for the 'Amazing Finale'!!! Love your colors and your graphic sentiment. Lovely card. The color is beautiful. Woo Hoo!! I feel like your card! I made it to the end of the blog hop!! lol your card is a great way to end the hop! Wonderful background, colours and fun sentiment! Your card is gorgeous!!! Love the choice of colors!!! What a perfect way to end the hop, Sue! Your card is gorgeous! Love the pretty colors and fun techniques you used! Well done! Fantastic card. Love the balloons, and the background and the sentiment!! I love everything!! Awesome card...Love the blues in the card...just amazing! Great colors - balloons are just happy and fun! Luscious colors! and great technique, thanks for sharing. I absolutely love this card. The colors are so beautiful. I love the shimmering blue and textured balloons. Love the colour blending and your spattered balloons, Sue. Gorgeous colours. I think I might just have to get that background stamp. What a beautiful card! Bright colours! Woohoo great card love it thanks for sharing. 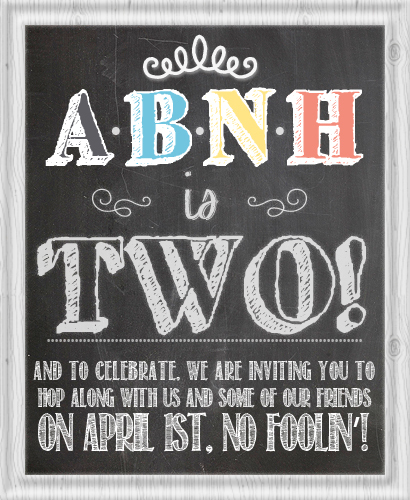 Congrats on ABNH turning two. What a pretty card. I love the colors so bright and cheerful. I like the perfect pearls technique. Beautiful card. I love these gorgeous colours. Your card is absolutely fab!! I love your colors and the dreamy look as the balloons float away carrying all the birthday wishes to never never land. You sure are talented with your inking and stamping and you sure are one clever, creative and talented gal!!! It's amazing the look the layered die cuts gives you....you'd swear they're attached with pop dots! Great card - love how bright & colorful it is!! Love the background, but especially am liking the size and style of the font for the sentiment! I am new to paper crafting and am just loving all the water color things that people are doing. Love your colors!! Love the colors and the layering of the balloons. These are some of my favorite colors. Love the contrast of the elegant background with the balloons. Last, but certainly not least! Love the colors and agree that the balloons are super cool. Thanks for the great idea and happy birthday Hero Arts Blog. this is just soooooo pretty! Fun design. I enjoyed your presentation of the balloons. Thank you. I love me some purple AND I have that stamp! I would love to recreate this card! Thanks for the inspiration!! Great card that is perfect for anyone celebrating an achievement. Thanks for sharing! Love the colors and card!! Pretty colors!! Thanks! Very pretty card perfect for many occasions with a little adaptation. Wonderful card with lovely colors ! Love the colors used on this. It makes the white POP! Thanks for being part of the HOP. Fabulous, love the colours you've used!! Great job with the distress inks - what a great product! Super fun and colorful card! I love the background, the colors are fabulous! Love the blues and the purples in this card. THe colors on this one are absolutely delicious! Love it!! Wow. This card is gorgeous. Thanks for sharing! I have seen so many beautiful cards along the way, I have some favorites, but they are all super. Your card is no exception, I love the colors. Love the background you made for your card. Gorgeous! I really like the embossed background with the distress inks, the colors are really pretty together. Thanks for sharing! Beautiful. I really need all those distress colors. what a beautiful background. I love your ombre effect. Love the colors used on your beautiful card and the perfect pearl splotches are a great idea that I will have to try! Thanks. Great colors. Water color look is really eye catching. Thanks for sharing! Love the ombre look...great colors for it. Love love love the beautiful blended colors! Gorgeous! I love your combination of blue and purple! So pretty! Love all that blending! Nice blending. I need to get my hands on the peacock feathers! Love your card and the balloons! Great job! Struck by the leaf & floral back ground stamp. I don't think I've seen it before. Looks great embossed and surrounded by distress ink. Such a pretty card! Love that background stamp! I have all the supplies to make this card. Think I'll give it a try. Lovely! The gradation of color on the background is beautiful. Great color - love the way the background turned out! fun card - love the colors! Love the colors you chose. The splotches on the balloons add great interest. Very creative card. Love the vibrancy of the colors...TFS! Love the deep vibrant colors! love the colorful distress ink'd balloons!!! Such a fab background stamp and the colors you used on this card are so vibrant - the balloons really stand out. I made it to the end and I learned lots of new techniques and now I want more stamps! Thanks for inspiring all of us! nice cards! Lovely card. Happy Birthday and TFS! Love the colours you used on your great card! Happy Balloons on a GORGEOUS background! Fabulous background!Love the colour combo! Oh wow, this is fabulous! LOVE the background! Happy bday to ABNH! I love the background you created and the fun balloons. Love the card! Especially the perfect pearls! The balloons are awesome also! Oh those Hero backgrounds are just awesome. Love the card. Thank you! Love your card and the background. Thanks for sharing. Love the colors of your card!! Very fun card! It's so interesting. I love how the distress inks blend together. Your Card ist just awesome. WOW your card is stunning! I love the color combination and that stamp white heat embossed is absolutely gorgeous! Love the colors and those balloons with the strings are just the perfect birthday touch! Thanks for sharing the inspiration! Very nice card, I love it ! Beautiful blues- what a grea hop- but my legs are tired! Ha ha! Really like that background stamp and the letters on the vellum for the sentiment. Great Card, TFS! Super cool background and floating balloons! Love that "woo hoo"! The size is perfect! wow your card is really amazing!!! Love your inky card! Makes me want to get inky too. Great birthday card! Fun BG! Lovely blending of colours for the background! Great colors and really pretty card! Great card! Love the inking and the balloons are such a nice touch! Thanks for sharing. That's a new technique, nestling the thick die cuts into the card itself. TFS. All I can say is WOW to your beautiful card! Lovely card. i love the embossed background. how did you manage to adhere 6 layers of balloon diecuts on straight!?!? !